Design Burd Inc.Cabin Fever! | Design Burd Inc.
Design Burd is so happy to share Decor Arts Now with you! Â Decor Arts Now is a Westchester, New York based blog written by a wonderful interior designer, and is a great resource for all fabulous things having to do with design! 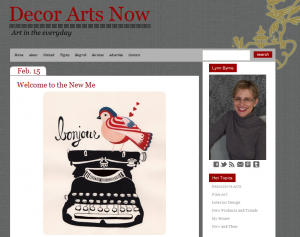 Â Design Burd took Decor Art's original site and redesigned and redeveloped it. Â We also migrated all of it's original content over to it's new custom WordPress site. Â With the Design Burd team's hard work and the tremendousÂ client support, we were able to design, develop and migrate years worth of posts to the new site in just over 3 weeks!Â So cozy up on this chilly winter day and take a look at all the hot design tips and trends on Decor Arts Now!